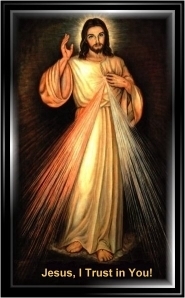 The image of the Divine Mercy originates from the private vision that Sr. Faustina had in the cell of the Plock convent on February 22 1931. In the evening when I was in my cell, I saw the Lord Jesus clothed in a white garment. One hand was raised in the gesture of blessing, the other was touching the garment at the breast. From beneath the garment, slightly drawn aside at the breast, there were emanating two large rays, one red, the other pale (...) After a while, Jesus said to me: Paint an image according to the pattern you see, with the signature: "Jesus, I trust in You". The image represents the crucified and risen Christ who brings man peace and salvation through remittance of sins and all the graces and gifts at the price of His passion. What is characteristic of the image are two rays: a red and a pale one. When asked about their meaning Jesus explained: The two rays denote Blood and Water. The pale ray stands for the Water which makes souls rightous. The red ray stands for the Blood which is the life of souls. Thus, the two rays denote above all the holy sacraments. Happy is the one who will dwell in their shelter, for the just hand of God shall not lay hold of him - said the Lord Jesus. Man's response to the above gifts of mercy is to be the attitude of trust. Hence in the inscription underneath the image, one is able to read the words: Jesus I Trust in You. The image representing God's mercy toward man is at the same time a sign which is to remind us about the evangelical summons to active love of one's neighbors. Thus, the cult of the image of Merciful Jesus consists in prayer of trust combined with deeds of mercy toward one's neighbors. In the revelations of Blessed Sr. Faustina, the Lord Jesus attached a number of promises to the thus understood veneration of the image of the Divine Mercy. The soul that will venerate this image will not perish - said the Lord, in this way promising salvation, as well as progress on the road to Christian perfection - a victory over the enemies of the soul, as well as the grace of a happy death. Yet the Lord Jesus did not limit His generosity to the above-mentioned specific graces, as He also said: I am offering people a vessel with which they are to keep coming for graces to the fountain of mercy. That vessel is this image with the signature: "Jesus, I trust in You". By means of this Image I shall be granting many graces to souls. The first image of Merciful Jesus had been painted by Eugeniusz Kazimirowski in Vilno in the year 1934. It was executed under the direct supervision of Sr. Faustina. The image had first been exposed to the faithful for public veneration in the Shrine of Our Lady of Mercy in Ostra Brama on the first Sunday after Easter on 26-28 April 1935. Today this image is being venerated in the church of the Holy Spirit in Vilno. Yet, it was the image of Merciful Jesus painted by Adolf Hyla which the artist presented to the convent chapel in Cracow-Lagiewniki as a votive offering for the miraculous saving of his family from the war, that has become famous throughout the world. In this way, the words spoken by the Lord Jesus to Sr. Faustina during the first vision Sr. Faustina had in Plock, had become reality: I desire that this image be venerated, first in your chapel, and then throughout the world.